LINCOLN, Neb. – The Central Illinois Flying Aces defeated the Lincoln Stars, 6 to 3, sweeping the season series. Midway through the first period, Stephen Halliday (Toronto, Ont.) broke out with the puck. Joe Dunlap (Windham, NH) joined the rush and beat his man to create a two-on-one. Halliday feathered the puck to Dunlap, but Dunlap was hooked before he could get the shot off resulting in a power play opportunity. On the power play, Trevor Janicke (Maple Grove, Minn.) one-timed the puck wide of the net. Halliday picked up the puck from behind the net and fed Cal Kiefiuk (Macomb, Mich.) at the left circle. Kiefiuk wristed his fifteenth of the season into the back of the net. A skate blade issue forced Mitchell Gibson (Phoenixville, Penn.) to replace Ryan Snowden (Kennett Square, Penn.) in net for the remainder of the first. Gibson made two saves as the Flying Aces limited the Stars to five shots in the period. Late in the first, Bradley Marek (Big Rapids, Mich.) poked the puck away from a Lincoln player in the defensive zone. Ryan Siedem (Madison, NJ) completed the steal and quickly sent the puck back to Marek who was exiting the zone with speed. Chad Hillebrand (Skokie, Ill.) joined Marek on the rush for a two-on-one. Marek’s initial shot was saved, but Hillebrand was there to put home the rebound. A little over a minute later, on the power play, Janicke was posted up at the left circle. He passed to Siedem at the point who quickly fed Kiefiuk at the right half-wall. Kiefiuk passed to Halliday below the goal line; the University of North Dakota commit threaded the puck to Janicke on the backdoor who had crept down near the crease for the three to nothing lead. Early in the second period, Jake Boltmann (Edina, Minn.) passed to Kiefiuk at the blue line. Kiefiuk took the puck down the left lane and found Tyler Gratton (Pottstown, Penn.) across the slot on the backdoor. The Penn State commit scored his eighth with the Aces this year. The assist was Boltmann’s first USHL point. Hillebrand tallied his second of the night midway through the second. He poked the puck out of the defensive zone. Dunlap beat the Lincoln player to the puck near the left half-wall and spun to pass it back to Hillebrand in the low slot. The University of Alaska-Anchorage commit lifted the puck top-shelf on his backhand. John Driscoll (Littleton, Colo.) also assisted on the goal. In the back half of the second period, Tristan Ashbrook got the Stars on the board after he scored from the slot after a turnover. A little over a minute into the third, Charlie Schoen scored for Lincoln as he put the puck top-shelf against the grain to make it a three-goal deficit. Philippe Lapointe (Burr Ridge, Ill.) scored the sixth goal of the game for Central Illinois midway through the 3rd. He was able to capitalize on net-front chaos and put the puck past the netminder from below the goal line by bouncing the puck off the goaltender’s stick. Kiefiuk was also involved in the net-front scramble. Lincoln scored their third of the game with less than five minutes remaining in the game. Steven Agriogianis put the rebound from a point shot past Snowden’s outstretched glove. The Flying Aces were perfect on the penalty kill, stopping all three Lincoln chances. They also scored on two of their three power play chances for a strong night of special teams’ work. Snowden backstopped the Aces to the victory with twenty-seven saves. 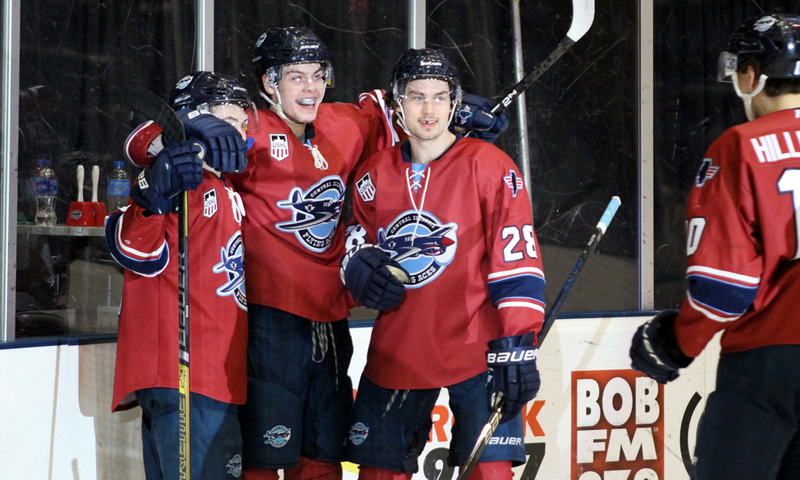 The Flying Aces travel to Chicago on Friday, April 12th to take on the Steel. Their final home game of the season will be Saturday, April 13th against the Cedar Rapids RoughRiders at 7:07 p.m.